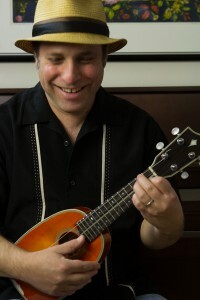 I am an experienced ukulele teacher and performer living in Portland, Oregon. I teach ukulele lessons out of my home in the South Tabor neighborhood in SE Portland. Ukuleles are the best instrument for beginners. With only four strings and simple fingerings, you can start strumming and singing along right away. As you progress, you will find that ukuleles are incredibly versatile. You can play rock, folk, jazz, bluegrass, and of course Hawaiian music! Kids are often able to start on ukulele at a young age, as early as five or six. Ukes are light and easy to carry. Kids can learn to play many songs by just using a few simple chords and strums. Some of the chords require just one finger, or even no fingers! I believe that music should always be fun, even when you’re working hard on it. I emphasize playing songs that students know and like right away, so ukulele lessons are fun. I teach students how to practice so they have fun while still making progress, using The Sandwich Method of practicing. Adults who are looking for a first instrument or a reason to get back into music should also consider ukulele lessons. On ukulele you can start playing real music right away, by just learning a few chords. It’s easy to get a grasp of musical basics, and you can have fun singing along with songs you know and love. The ukulele has become very popular, so it’s easy to find fellow learners to play with. Group Lessons also available. Just ask!